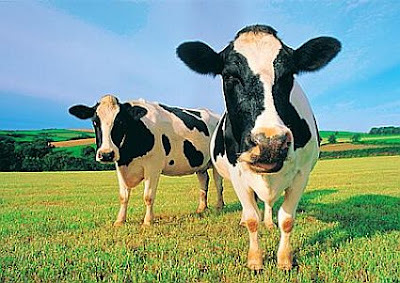 What is it we find so funny about cows? I saw this headline on the WTMJ, Milwaukee website; and, before I even read the article, I knew it was a serious matter for the cows and the farmer who owned them. But I couldn't help it; I just broke out laughing. Here's the story. Now tell me if you can read this whole thing without at least a smile. MARTELL, Wisc. -- The Rush River at Martell is known for its trout fishing. But Wednesday's catch of the day was cows. "We should have put floaties on them or something," said Pierce County farmer Tim Wiff. Wiff's herd of pregnant heifers survived Wednesday's early morning six-inch deluge just fine in their pasture. The trouble came after sunrise when some 80 head of cattle tried to cross the swollen Rush River to get back to their barn for feeding - and floated away. "You could see 20 to 25 cows all in a blob just flying with the current down the river and it was just shocking," said Doreen Smith, who watched, stunned, as cattle floated by. With help from friends and neighbors, Wiff was able to round up most of the heifers that floated away. Some were found as far as three miles downstream. "Most of them when they came on the trailer they looked fine. They looked tired. You could tell they've been working to get out of the river." Wiff says 10 to 15 heifers are still missing. He's hopeful more will be found alive, though he expects some will be found dead once the water recedes. Still, Wiff considers himself lucky so many of his heifers came home. "We'll bed them good tonight and feed them and tell them to stay home," he laughed. You have two cows. You sell three of them to your publicly listed company, using letters of credit opened by your brother-in-law at the bank, then execute a debt/equity swap with an associated general offer so that you get all four cows back, with a tax exemption for five cows. The milk rights of the six cows are transferred via an intermediary to a Cayman Island company secretly owned by the majority shareholder who sells the rights to all seven cows back to your listed company. The annual report says the company owns eight cows, with an option on one more. The public buys your bull.